Steps from the Drake! Spring is in the air. 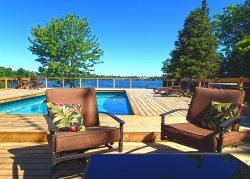 Getaway this April to Prince Edward County for as little as $125 per couple per night. 21 East is a cozy 2 bed, 2 bath all-season cottage in the heart of the village of Wellington, with views of Lake Ontario and steps to delicious eateries, shops and the Wellington beach. Enjoy a pint at Midtown Brewery or join us on a guided wine tour. Save $10 off pp per tour when you stay with us during the month of April. Special rate is based on an occupancy of 4 for a minimum 2 night stay. BOOK ONLINE TODAY. Other properties may offer a discounted rate. CONTACT US at [email protected] for more info. A relaxing way to enjoy a Romantic Getaway! Stay in the heart of wine country at Corner Haven Suite and explore County wineries with a Half Day guided Wine Tour. With this package you get a 2 nights stay at a fully furnished suite located in the heart of Wellington and a Half Day Wine Tour for 2. Leave the kids, the spouse and the office behind, get away for a girls getaway and enjoy County living in one of our Vacation homes. Bust out the fluffy slippers and jammy-pants. This grown-up version of the slumber party is a great chance to re-connect with the special ladies in your life. Starting at $190 per person +HST. Available after Thanksgiving to before May Long weekend. (Packages can accommodate 4 to 18 guests). For more info check out Girls Getaway PEC.